Based on a popular series of German adventure novels written by Paul Alfred Müller, the Kommissar X series were translated into a blitzkrieg of seven films, released between 1965 and 1971, to cash in on the popular success of the James Bond movies and the resulting explosion of Eurospy cash-ins. 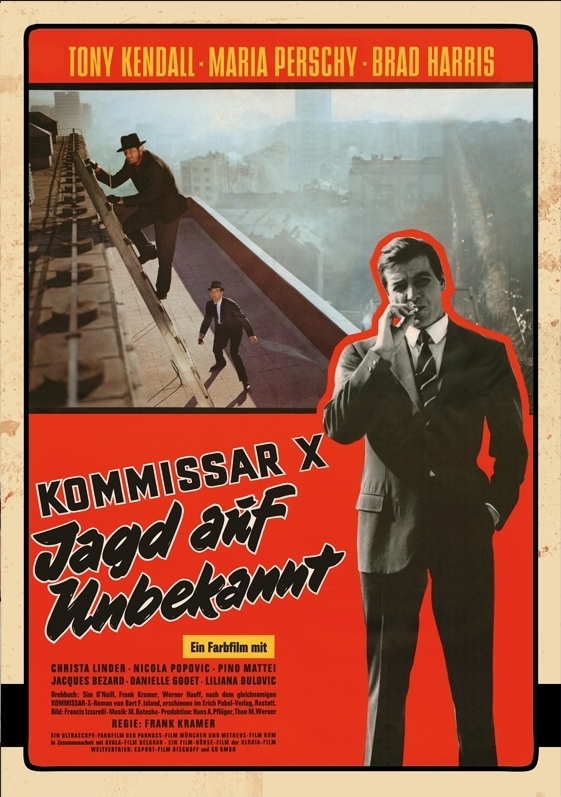 A German-Italian-Yugoslavian co-production, the films were essentially the brainchild of Gianfranco Parolini, who wrote and directed most of them, which featured the exploits of New York City private eye and lady-killer, Joe Walker (Kendall), and NYPD captain (and/or depending on the film, Special FBI agent) Tom Rowland (Harris), who usually found themselves sparring with each other while being up to their necks in international intrigue, where they would eventually team up to take down the bad guy -- usually with Walker getting the girl while Harris did the heavy lifting. 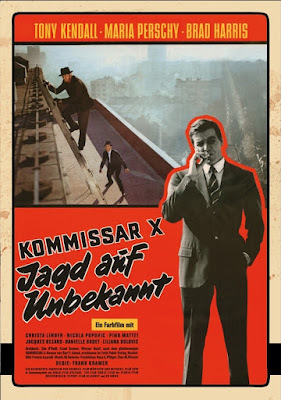 In the inaugural film, Kommissar X: Jagd auf Unbekannt a/k/a 12 Donne D'oro a/k/a Kiss Kiss, Kill Kill (1965) Walker finds himself in Yugoslavia, hot on the trail of a missing nuclear scientist, while Rowland is already there for some special training with the local authorities. That is he was until these two’s paths cross over a pile of dead bodies and a string of clues that leads them to a remote island, a massive secret lair of an unhinged despot, and a ton of radioactive gold guarded by an army of hypnotized Glamazons. 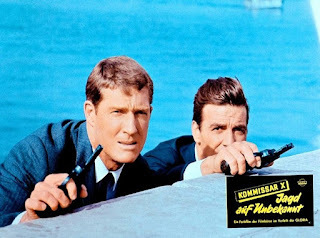 The two would then reunite and carry on the fight in Death is Nimble, Death is Quick (1966), So Darling, So Deadly (1966), the LSD fueled Death Trip (1967), Kill Panther Kill (1968), The Island of Lost Girls (1969) and Tiger Gang (1971). Now, I know a lot of times movie posters, box and cover art tends to lie to us in an effort to sucker the viewer into taking a look at something that in no way, shape or form could live up to those expectations. But I am here to tell you these posters are most definitely NOT an exaggeration. Everything shown actually happens in the movie. Honest. Yes, even those knock-off A.I.M. bee-keeper mad scientists and that army of uniformed Fem-Force are involved in a big battle royale at the end of this thing. And believe you me all of the Kommissar X films are that gonzo, buoyed by some great chemistry between Kendall and Harris, and are chock full of humor, intrigue, spy shenanigans, spectacular stunts, nifty soundtracks, eye-candy, and plenty of dust-ups. Sadly, most of these never garnered a theatrical release in the States but all were a staple of late night TV in the 1960s. 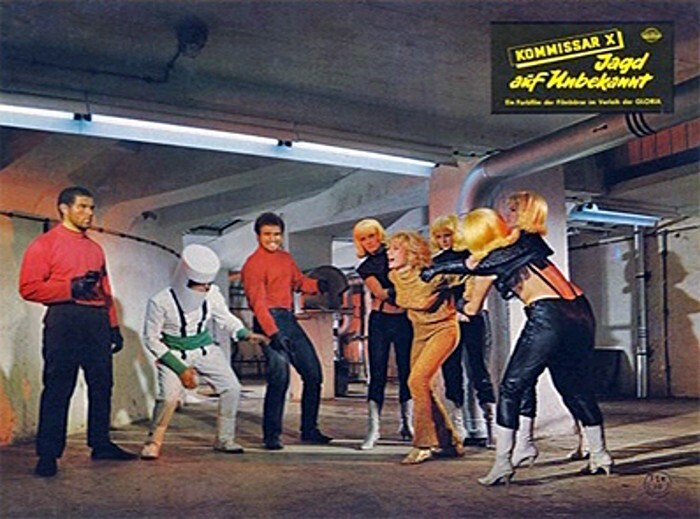 There is one Kommissar X boxset available for purchase that contains the first three films but these are of dubious quality. And while something is better than nothing, if you poke around the web a bit there are plenty of better prints in the original aspect ratios dubbed into English just waiting for you to take the plunge. Now what in the hell are you waiting for? Oh, and good luck digging this out of your ears, too.